Thunderbird Casino is among Oklahoma’s finest gaming destinations, designed to be the premier boutique gaming establishment in Oklahoma. At Thunderbird Casino, you’ll not only find the friendliest dealers and casino personnel, but some of the hottest gaming action in the state, dealing popular table games like Blackjack as well as hundreds of both new and classic gaming machines for hours of fun and winning! 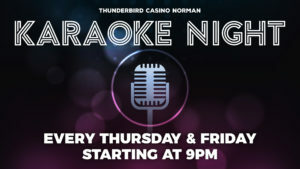 See the Dining Specials for Thunderbird Casino in Norman!